Should diagnostics (see also Oncology – Skin Cancer Diagnostics) reveal that you have skin cancer (basal-cell carcinoma, squamous cell carcinoma, malignant melanoma, Merkel cell carcinoma, Kaposi sarcoma or others), you find highly competent physicians who are among the most experienced and well-known doctors nationally and internationally in this field at DERMATOLOGKUM BERLIN. 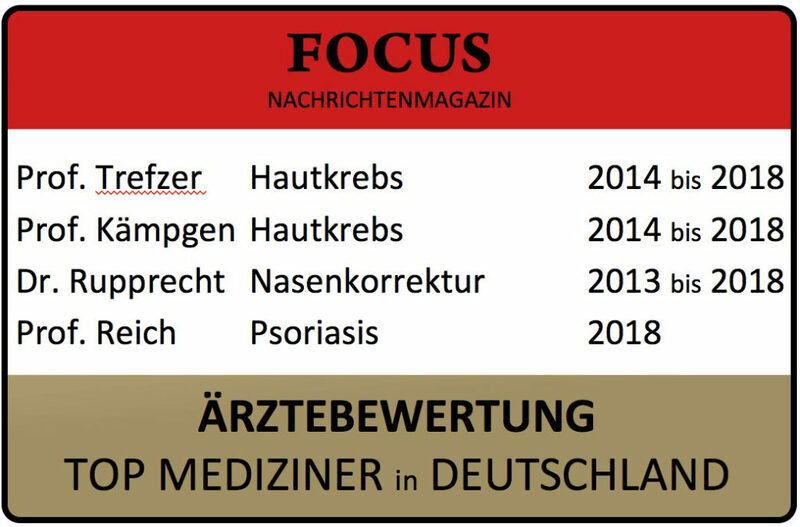 Prof. Dr. Trefzer and Prof. Dr. Kämpgen have both headed the melanoma centres of German university clinics (Charité in Berlin and university clinic Erlangen) and have for many years been regularly named in the FOCUS physicians’ directory as outstanding specialists in the field of “skin cancer”. Dr. Rupprecht has a double specialisation as dermatologist and plastic & aesthetic surgeon and has been conducting skin cancer surgeries as one of his focuses for over 20 years. Depending on the type of skin cancer, its localisation on the body and its extent, very different therapy methods are available for the treatment of the skin cancer. Of course, the characteristics of a patient like age, other diseases, drug intake or allergies, are considered when deciding upon a therapy procedure. Furthermore, a patient’s special preferences are taken into account if medically possible. Superficial skin tumours and skin tumour precursors can sometimes be treated with medication (creams and others) and often an ablation by laser is possible (see also Laser Centre – Skin Cancer Precursors). Very often, the surgical removal is the therapeutic method of choice for skin cancer (the so called “golden standard”). The surgical removal of skin cancer can take place as outpatient treatment for a majority of patients. In most cases – depending on size and localisation of the tumour as well as the expected surgery duration – the surgery can take place under local anaesthesia, but if necessary also with sedation (“twilight sleep”) or general anaesthesia. The wound closure is always performed under consideration of plastic surgical criteria and held up to the highest aesthetical standards. This is especially important for skin cancer in aesthetically sophisticated bodily regions (e.g. the face). The large majority of skin cancer surgeries are performed in one of the two cutting-edge operating rooms at DERMATOLOGIKUM BERLIN. If necessary, tumour surgeries can also be carried out at different private clinics in Berlin. For the malignant melanoma, the surgical removal of the primary draining lymph node (the so-called sentinel node) can be recommended in accordance with the current medical guidelines in some situations. The lymph node is then elaborately examined microscopically and immunohistologically. Of course, DERMATOLOGIKUM BERLIN also offers these kinds of surgeries (a gamma probe for intraoperative diagnostics is available) that typically take place as outpatient treatment using general anaesthesia. We organise the patient’s preoperative scintigraphic labelling of the sentinel node at a large nuclear medical practice. Should a further measure be necessary after skin cancer surgery, it is usually a drug treatment by means of pills or infusions. The physicians at DERMATOLOGIKUM BERLIN possess extensive expertise in the treatment of all types of skin cancer with drugs and have access to the most modern and innovate therapy methods. Some of these special treatments are provided in our day hospital (see also Our Day Hospital – Multimodal Treatment Possibilities) where you can receive an infusion in comfortable chairs or couches and go home afterwards. Virtually all treatments are outpatient ones. The interlinking of diagnostics, surgery and systemic therapy is crucial for the treatment of skin cancer. We enforce this interlinking regularly as all patients with skin cancer are discussed in the team to achieve optimal results. We closely follow the guidelines of the medical societies so that you always receive the scientifically best and most up to date therapy in our practice. We are regularly among the first to be able to offer you new forms of therapy for skin cancer. Examples are therapies with BRAF inhibitors like Vemurafenib (Zelboraf) or Dabrafenib (Taflinar) or immune therapy with antibodies like Ipilimumab (Yervoy) for patients with malignant melanoma. The best therapy for our patients is always created by our team and discussed with the patient in a detailed conversation. Extensive written information material is also available.